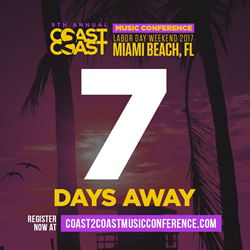 2017 Coast 2 Coast LIVE Music Conference Is Just One Week Away! The Coast 2 Coast Music Conference 2017 kicks off next week just in time for Labor Day weekend. This year's music conference offers an array of industry professionals, discussion panels, performance opportunites, and after parties, including the VIP Yacht Party which will close out the conference. This will also be the first year that Coast 2 Coast LIVE awards their World Chamipionship winner with $25,000 cash prize, a recording contract with Coast 2 Coast, as well as a number of promotional prizes. Those who still wish to attend this year's Coast 2 Coast Music Conference can still register and purchase their weekend and VIP passes at the official website. A full list of featured panelists for this year's music conference is currently posted on the main website. A full schedule of events for the 2017 Coast 2 Coast Music Conference can also be found at the official website. About Coast 2 Coast LIVE: Coast 2 Coast LIVE is the largest artist showcase in the world and tours the country looking for the next stars in all musical genres using our patented interactive platform. Coast 2 Coast LIVE puts the artist in front of celebrity judges to showcase their talents, while the judges give scores and feedback live via our interactive judging system on iPads, allowing artists to instantly get feedback on their performance and music from experts in their craft. Our events are open to all artists, just submit your music at coast2coastlive.com for the next event in your area, get votes from your fans, and if selected you can perform at our event, sell tickets, and win the grand prize package! About Coast 2 Coast Music Conference: The Coast 2 Coast Music Conference is an annual networking event bringing together top industry DJs, producers, A&Rs, program directors and more to speak on formal panels and give practical advice to developing independent artists. The conference also features workshops, showcase events, DJ Battles, Model Contest, Afterparties and the grand finale VIP Yacht Cruise through beautiful Miami and the Biscayne Bay! All of this leads up to our World Championships showcase, where the top performer of the year will be crowned and awarded a cash prize of $25,000 as well as an exclusive record deal with Coast 2 Coast. This is one event you don't want to miss so be sure to sign up for the next Coast 2 Coast LIVE event in your nearest city! Coast 2 Coast LIVE - Interactive Showcase Events Finding the STARS of Tomorrow!